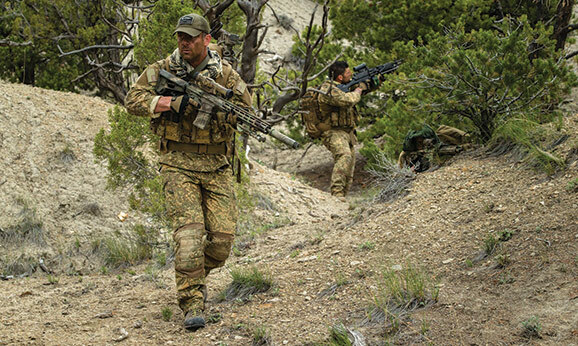 Q: It would be good just to refresh over the Specter range of products and who alongside USSOCOM, Land 125 Australia and UK FIST are using this product range, and why it is so sought after? Watch for new product launches in 2018! The unique, one of a kind capability of the Specter DR dual role weapon sight. The ability to instantly switch between a close quarters sight and a magnified sight is still a capability that is unique to this optic. The optical quality of ELCAN Specter rifle sights. As a high precision optical systems designer and manufacturer, Raytheon ELCAN provides a distinct advantage with respect to clarity and light gathering capability of the systems. The uncompromised robustness of ELCAN Specter optical sights. ELCAN Specter optical weapon sights are rugged and combat-proven in the harshest, variable environments. Q: With the use of integrated systems where technology is talking to other technology along either the fire command or target acquisition how are ELCAN adapting their products to fit with this? A: In today’s threat environment and on the battlefield of the future, it is not good enough to be better; you have to overmatch adversarial forces – with clear, decisive and overwhelming advantages. Raytheon puts these capabilities in the hands of every warfighter, with a portfolio of integrated, precise and proven solutions. Raytheon ELCAN leverages its expertise to provide overmatch advantage for sighting systems. The era of digital sighting systems is now and Raytheon ELCAN believes it will become an increasingly important component of the integrated warfighter kit; significantly enhancing precision, accuracy, lethality and connectivity in the battlespace. Some key capabilities that digital sighting systems will allow in the near future include digital micro- display, integrated laser range finder, onboard ballistic computation module, digital targeting and aiming reticle. Digital technology will give the warfighter first generation, push-button, macro-automated functionality that automatically ranges targets, calculates shot correction via the onboard ballistic computer and presents the shooter with a digitally disturbed, high color-contrasted targeting reticle in the field of view. Beyond the first generation capabilities, future generations of digital sighting systems for the designated marksman, will allow capabilities such as designation for static and mobile targets, target tracking, dynamic ranging and ballistic computation, wireless offloading of digital targeting solutions and net-centric target data sharing. Q: You have had slight adjustments in your International and US Strategy could you explain this and the benefits going forward in terms of purchasing from you and general day to day contact? A: Raytheon ELCAN’s primary focus is on simplifying the acquisition process for our US and international customers. To that end, we are constantly evaluating new procurement vehicles that are intuitive, user friendly and streamline the acquisition process, thus allowing our global customers more efficient and cost effective access to Raytheon ELCAN products. All inquiries for ELCAN Specter Sights can be sent to Dan Pettry, a former US Army Ranger and sniper, now a product manager for Raytheon ELCAN Rifle Sights at daniel.pettry@raytheon.com or +1.706.905.1283. Q: With the new technologies coming into the battle ground in the area of Optics how do you see this developing and where do you feel the most dramatic changes will be? A: Incorporating internal research and feedback from SME end users, Raytheon has identified five key areas that will inform future development of ELCAN Specter sights (1) optical design, (2) precision targeting, (3) survivability, (4) lethality and, (5) SWAP-C.
Optical design: Future combat sighting system optical designs will likely incorporate disruptive capabilities in adaptive optics including “liquid” polymer lens technology, free form optics and other highly specialized optical designs in lieu of moving tele-focal groups. This bio-mimicking lens technology will significantly advance future sighting system performance and functionality, while ultimately reducing SWaP-C. Precision Targeting: Raytheon ELCAN believes that future generations of digital sighting systems will incorporate hyper-accurate wind sensing microprocessors in the visible and/or IR spectrum, internal laser marking and designation, enhanced target mensuration capabilities, internal laser spotter functionality and precision azimuth and vertical angle modularity (PAVAM) where sighting systems effectively incorporate the earth’s spin to provide increasingly precise targeting data. Lethality: digital sighting technologies will incorporate capabilities including non-gyroscopic, weapon attitude stabilization technologies that nullify the effects of trigger flinch, shaking and shooter input error; sighting and weapon system electronic interface; helmet-mounted or goggle- based optics wirelessly slaved to weapon-mounted targeting systems; and portable forward entry device capability, giving the shooter the ability to forward ballistic solutions/targeting data to fire support C2 elements. Survivability: digital sighting systems will eventually offer enhanced, reliable and secure Identification Friend or Foe (IFF) capabilities where non-enemy combatants are marked as friendlies within the FOV, thereby reducing the “fog of war” and minimizing friendly fire incidents. In first generation systems, incorporating these capabilities will invariably require additional power and likely additional weight. However, we believe that the acceptance of digital sighting systems in combat arms will hasten the development of innovations in SWAP-C, including powered rail designs that will provide power to the accessories, thus reducing SWAP-C total battery requirements and usage. Also, as future digital displays and other micro-technologies become more energy efficient, the overall SWAP footprint will be further reduced. Ruggedizing the electronics and reducing overall system cost will present a challenge in first generation designs. However, system reliability will increase as digital sighting systems gain wider acceptance in combat arms and costs will decrease as the systems are deployed in greater numbers. Q: Looking into 2018 will ELCAN be hosting any events where your products can be tested? A: The 2018 schedule is still being revised. Inquiries can be sent to daniel.pettry@raytheon.com to enquire about new products and events.